Permanent magnet is called Rare earth magnet which includes NdFeB, Alnico, SmCo. NdFeB is the most powerful type with higher BH and HCj. Nd material is the most important rare earth material, also with high content, the content is different according to the different Grade, it is from 20%-32.5% . Dy and Pr also are the important material. Anyway, under the influence of Nd material price fluctuations, since middle of July, NdFeB price begin to rise, and sharply rise again. SmCo materials is easier to process kinds of shape, And can stand higher working temperature upto 350℃. Permanent magnets are used for Motor, Pumps, wind power and Automobiles. Most Pumps adopt NdFeB magnets and SmCo as parts on Magnetic Coupling, Magnetic clutch, Magnetic rotor. Magnet is affected under the working environment, its performance will gradually change, when purchase magnet for new product, the user usually choose two or more grades of magnet to test which Grade is more suitable for the product. How will they regard the test result, how should choose grade? It is necessary to discuss High temperature Permanent Magnets for motor. The working temperature is variational. The testing result (especially under high temperature with different Grade) is much more different, because of the different working temperature and work time and other factors: Br, HCJ, BHmax. If you test the magnets under room temperature, the N45SH must be stronger than N40UH, but under 80℃, 100℃, 120 ℃, the N45SH become less strong than N40UH.Because the N45SH (150℃) will be demagnetized more than N40UH(180℃). When purchase Permanent Magnets, it is better to know the Br. 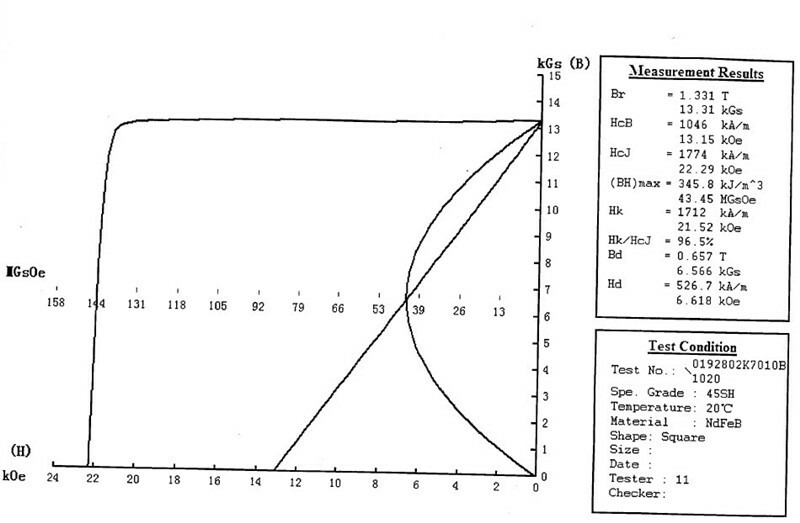 HCJ, BHmax values to make magnets suitable for motor.